In Texas, football rules the fall. I made this dialysis bulletin board to pull in the football excitement at Texas A&M and teach a few principles. You could easily replace the burly football player below with your regional team or even regional mascot. This is also a great bulletin board for Superbowl time in January! Any sort of food could go here! 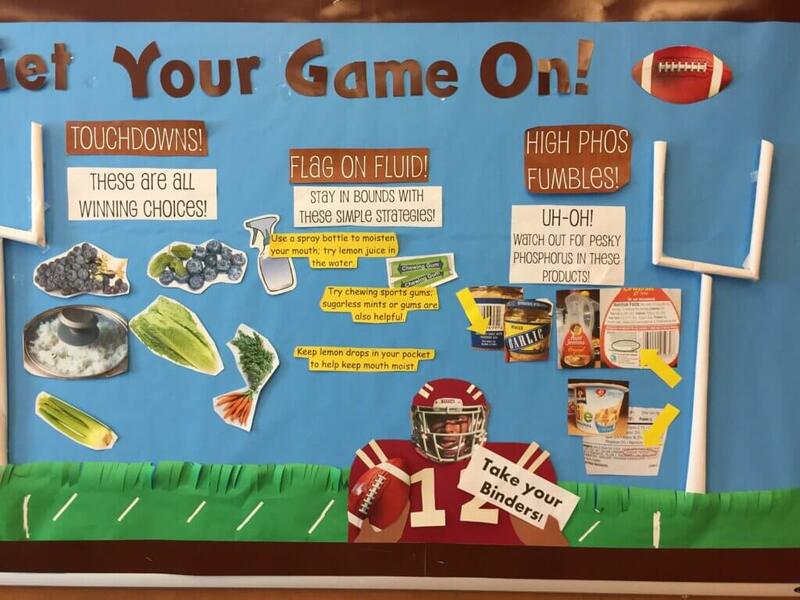 You could even ramp this dialysis bulletin board up a notch by showing awesome tailgating ideas. I kept it simple with grapes, blueberries, rice, lettuce, celery and carrots. The file is stored for download in the Renal Education Library and in RD2RD. It includes some extra pictures not shown on the bulletin board. Use a spray bottle to moisten your mouth. Try lemon juice in water. Try chewing sports gums; sugarless mints or sugar-free gum are also helpful. Keep lemon drops in your pocket to help keep your mouth moist. There are a number of high phosphorus foods you could put here. I chose to include phosphate additives in some common products I had heard my patients talking about in our monthly labs. Syrup, cereal, and even something benign as garlic can have phosphate additives. I included a few more high phos foods in the file if you have more room on your board. Get the downloadable .pptx file here! You can download the file by becoming a member of the Renal Education Library or by visiting RD2RD.com and purchasing there. Rah rah for saving time!